Netanyahu meets with Putin in Moscow, urges Russia to confront 'murderous ideologies' as the two discuss Syrian civil war, Iranian regime. 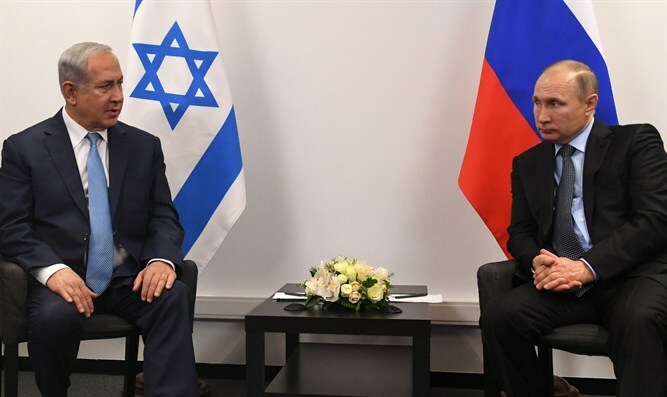 Israeli Prime Minister Binyamin Netanyahu met with Russian President Vladimir Putin in Moscow Monday to discuss security arrangements between Israeli and Russian forces during the ongoing Syrian civil war, as well as Israeli concerns regarding Iranian expansion into both Syria and Lebanon. The two leaders held a brief joint press conference before their closed-door meeting. In their comments during the press conference, held in Moscow’s Jewish Museum and Tolerance Center, Prime Minister Netanyahu alluded to International Holocaust Remembrance Day, which was observed worldwide on Saturday, and highlighted the Soviet Union’s casualties during its fight against Nazi Germany during World War II. The Prime Minister then turned to the present day threat posed by radical Islam, saying that “murderous ideologies” must be confronted and defeated. While Netanyahu did not mention Iran by name during the press conference, Iran and its involvement in the Syrian civil war and growing influence in Lebanon were dealt with during the subsequent meeting with Putin. Ahead of his trip to Russia, Netanyahu laid out the agenda for the meeting. "I will discuss with President Putin Iran's relentless efforts to establish a military presence in Syria, which we oppose and are also taking action against. "We will also discuss Iran's effort to turn Lebanon into one giant missile site, a site for precision missiles against the State of Israel, which we will not tolerate."